A Rabat Stenciled Master Bedroom Idea That is Simply Ravishing! Welcome Back my stencil loving peeps! I bet you’re wondering what we’re all buzzing about today at Cutting Edge Stencils! Today’s Stencil Stories is a blast from out stenciled past. Meet Joey and Lana, the DIY couple responsible for the blog, Making a House a Home. 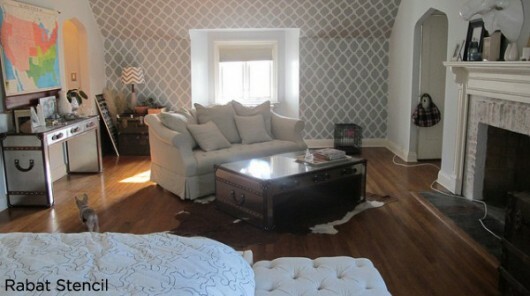 Recently, Lana reminded me about the Rabat stenciled master bedroom that the pair had completed. And boy is this room a real stunner! Do you understand how amazing this master bedroom really is? After all when you combine the captivating power of the rabat stencil with a sloped wall and you get an absolutely stunning space! WOOHOO! Boy, does stenciling really make a difference in a room. It can really add that WOW factor and after you complete the project, a strong sense of accomplishment. The soft color combination of gray and white is super trendy right now. Add that to the stylish Moroccan stencil and it really brings new life to a simple all white bedroom. To get this look consider using Benjamin Moore’s nightingale AF-670 and minced onion 2145-60. This classic combination of hues creates a unifying look that calms and restores the space, perfect for a bedroom retreat! The results are absolutely gorgeous! And I’m sure Joey and Lana feel like complete rockstars with their stencil accomplishment! What do you think of this Ravishing Rabat Stenciled Master Bedroom? Leave us your thoughts in the comments below! Buy a Rabat Stencil and revitalize your own bedroom space!